This annual event recognizes inductees to the Ohio Veterans Hall of Fame, which has inducted more than 560 veterans since its inception in 1992. 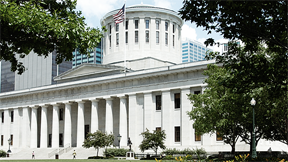 Each year, an executive committee, made up of representatives from Ohio's veterans organizations, selects 20 inductees from applications received from across the state and nation. Our inductees are leaders in a variety of areas including business, entertainment and education. Most importantly though, they all have made significant impacts on their communities. Inductees into the Ohio Veterans Hall of Fame served their country honorably in a branch of military service and continued to serve their communities, state and nation after discharge.